Barbeyrac informs us that the States of the division of Nimeguen had established an university in that city about the middle of the preceding century. Six professors were appointed, who taught the usual sciences, and degrees were conferred; but the two other divisions of Guelderiand always op posed this establishment, and the sovereign court of the province refused to admit as advocates those who had taken their degrees at Nimegueu. This university therefore soon fell into decay, and in 1648 that of Harderwyk was founded by universal consent. | of more advantage to himself and to the public. 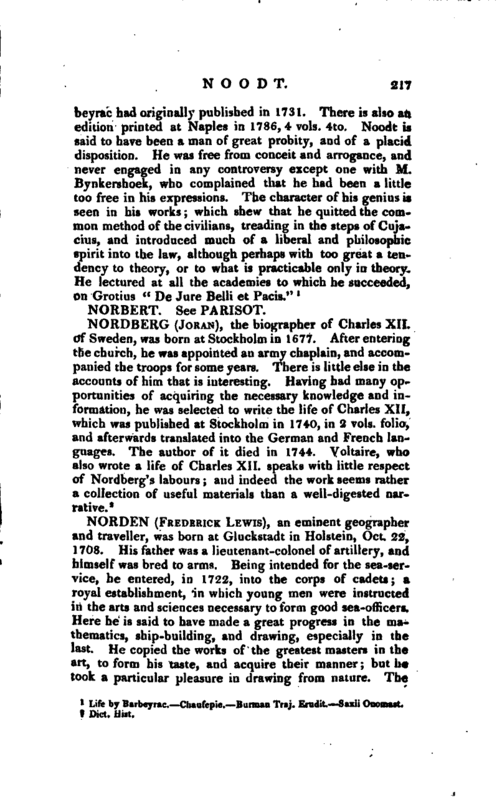 Complying with this advice he studied law three years under Peter de Greve; during which time he maintained two public theses with uncommon reputation. The second of these, “De acquirenda, et retinenda, et amittenda possessione,” which was of his own composition, he defended with such masterly knowledge, that the professor had not occasion to say a word throughout the whole disputation. 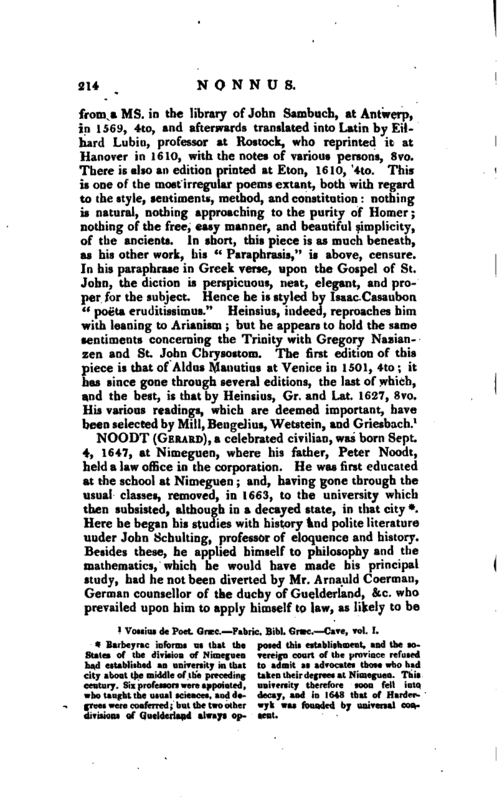 As soon as he had completed his course of study here, he visited the other universities of Leyden, Utrecht, and shortly after Franeker, where he was created LL. D. in June 1669. He then returned to his own country, and entered upon the practice of his profession, in which he soon had an opportunity of acquiring fame by his defence of two criminals, who were accused of murder in 1671. Noodt appeared advocate for them, by the special appointment of the magistrates of Nimeguen; and he exerted himself so well in their behalf, that one of them was entirely acquitted, and the other only sentenced to banishment for two years. This cause established his reputation, and, the same year, he was elected professor of law in ordinary in the university of Nimeguen, although only in his twenty-fourth year. During the congress held there in 1677, his talents became known to several of the foreign ministers, and the plenipotentiary from the elector of Brandenburg tempted him with the offer of a professorship in the university of Duysbourg, which he refused, although that of Nimeguen was approaching to dissolution. 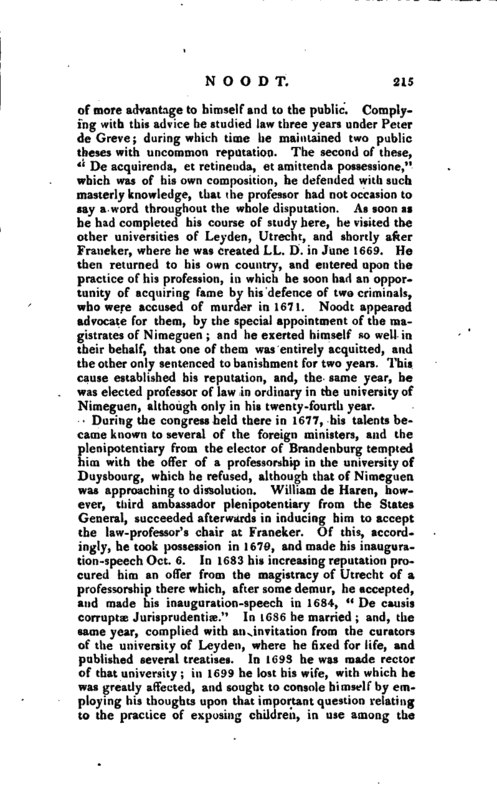 William de Haren, however, third ambassador plenipotentiary from the States General, succeeded afterwards in inducing him to accept the law-professor’s chair at Franeker. Of this, accordingly, he took possession in 1670, and made his inauguration-speech Oct. 6. In 1683 his increasing reputation procured him an offer from the magistracy of Utrecht of a professorship there which, after some demur, he accepted, and made his inauguration-speech in 1684, “De causis corrupts Jurisprudentise.” In 1686 he married; and, the same year, complied with an invitation from the curators of the university of Leyden, where he fixed for life, and published several treatises. 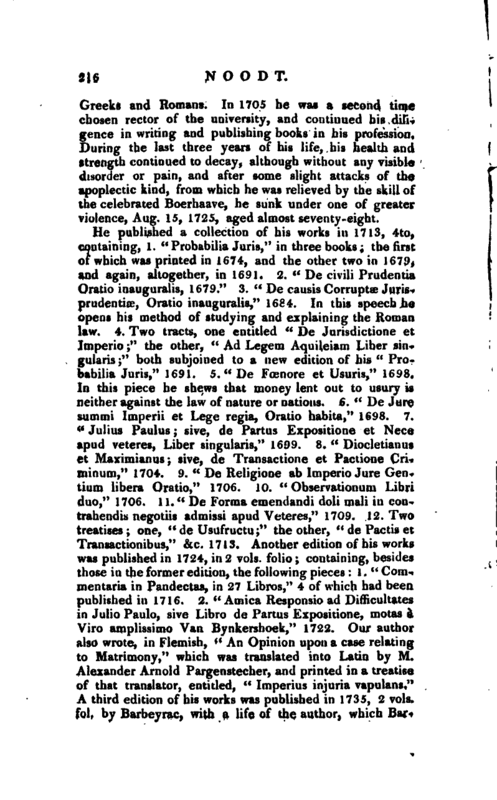 In 1698 he was made rector of that university in 1699 he lost his wife, with which he was greatly affected, and sought to console himself by employing his thoughts upon that important question relating to the practice of exposing children, in use among the | Greeks and Romans. In 1705 he was a second time chosen rector of the university, and continued his dilU gence in writing and publishing books in his profession. During the last three years of his life, his health and strength continued to decay, although without any visible disorder or pain, and after some slight attacks of the apoplectic kind, from which he was relieved by the skill of the celebrated Boerhaave, he sunk under one of greater violence, Aug. 15, 1725, aged almost seventy-eight. Life by Barbeyrac. Cbaufepie. Burtnan Traj. Erudit. —Saxii Onomast.